Lead singer, Josh Grigsby grew up in King George, which is the gateway to the Northern Neck. His bluegrass influences came at an early age, helping his father, who was a waterman by trade, on the water fishing, crabbing and oystering. His father, James ‘Bubby’ Grigsby, would always have bluegrass greats on the stereo such as Flat and Scruggs, and Reno and Smiley and the County Gentlemen to name a few. Bubby also loved the older country music by the likes of folks such as Jim Reeves. Josh grew to love this music as well, even as a youngster, but also was influenced by country music greats such as Vince Gill, Don Williams, and the country music icons of the 80’s and 90’s. Josh started singing by the time he was two to family and churches, and later at local establishments that offered live music and karaoke. He became a crowd favorite at Donk’s Theater in Mathews, Virginia singing county music at the venue with the house band Shades of County. Josh started going to bluegrass jams in the area and folks encouraged him to start a band, which is where Josh Grigsby and County Line began in 2013. The band became very popular on the local music scene. The most memorable moments for Josh was opening a show for legendary Alan Mills and the Lost and Found when the band was less than a year old and winning the 2014 East Coast Bluegrass Competition in Gloucester, Va. Josh is a self taught rhythm guitarist for the band as well, but his tenor voice is what draws folks to his shows. Josh’s recent bluegrass influences are IIIrd Tyme Out and the Seldom Scene, Josh enjoys people, and is just and all around good ol’ county boy. So if you are ever at a show, make sure to shake and howdy with him. Judge Parker, originally from Henry County, Georgia, now calls Short Pump, Virginia home. He provides banjo and vocals for JGCL. Judge's early musical influences were rock and roll and rockabilly and his first band experience was playing saxaphone in a high school rock band. He was introduced to the banjo in college by Wade Macey who was a math professor where Judge attended junior college. Wade had worked his way through college playing with Mac Wiseman. Judge was "blown away" with Wade's banjo work and it changed the course of his life. After school and a couple of false starts at a real job, Judge began a pursuit of music and was a professional musician from 1974 to 1983. He began his career with "Nickel Ticket" an Atlanta band after which he co founded the "Saturday Session Band", a successful local Georgia group that opened for or shared venues with such bands as the Nitty Gritty Dirt Band, Doug Kershaw, the Earl Scruggs Review, Ray Stevens & others. Saturday Session was honored to be invited to play at the National Visitors Center in Washington DC for Jimmy Carter's Presidential Inaugural ceremonies. Along with partners, the band also opened the "Blue Eagle", a music hall and tavern in Sandy Springs, Ga. Later, the "Judge Parker Band" (no connection to the current band by that name) performed briefly as the back-up band for Ben Jones (Cooter of the "Dukes of Hazard"). He was voted Atlanta's Best Banjo Player by readers of Atlanta Magazine in 1978. Judge also played "the banjo player" in the 1977 Columbia Pictures movie "The Farmer". Shortly after the birth of his son in 1982, Judge chose to leave music to pursue a career in business that would allow him more time with his new family. After a 30 year layoff, he has recently renewed his interest in music and is having "more fun than he can stand" being a part of JGCL. Robert Kidd, from Mechanicsville VA plays bass for Josh Grigsby and County Line. His major musical influence were local musicians Brian Sulser, who mentored him and inspired him to play ‘better bass’. Another local musician who made a big difference in his playing was Bob Payne who worked with Bob to perfect his trade. It is evident in his playing. As a youngster, Bob would sit on his daddy’s lap and play guitar with him as he played Hank Williams songs. In 1966, he pursued his love for music, playing bass in a rock & roll band. The band ended in 1967. Bob took a hiatus from playing and did not play bass again until 2004 when his father asked him to get his old bass from under the bed at his house. Learning bass was not going to be easy him, but after a year he was hired by Flatland Bluegrass Band. He played with them for a year and a half. Afterwards, he helped form Willow Creek Band, and little later he joined Easy Street band. Robert enjoys all types of bass and also played with a 30 and 40s swing band, a Pack of Luckies for several years. Bob, along with his friend George Winn were in the documentary “Strumming up the Past: Henrico's Bluegrass Music. He attends a weekly Bluegrass jam with his friends in Goochland , which has brought much joy to his life. Mark Mills from Chesterfield, Virginia, provides lead guitar and vocals for JGCL. Mark started playing guitar at the age of 12 and went through country music and rock and roll before discovering Bluegrass in his late teens. He learned to play mandolin and joined JC Hale and the Blu Fescue. After a few years with JC, he became a founding member of the New Spring Grass until he joined the Richmond Fire Department in 1977. Working 24-hour shifts every other day allowed no time for a band. He had to leave the music he loved until 2000 when a former member of New Spring Grass asked him to come play with Copper Ridge. His work schedule had changed by then and playing in a band was possible. He was with Copper Ridge for over 15 years. 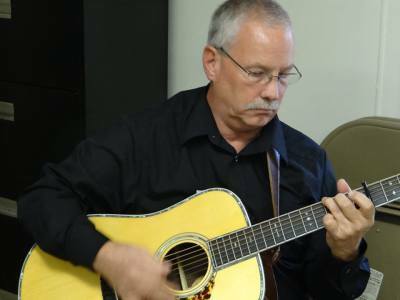 He retired from the Richmond Fire Department in 2007 and is looking forward to making great music with Josh Grigsby and County Line and spending time with his family and four granddaughters. Whitney Perkins from Chesterfeild, Virginia provides Resonator for JGCL. Whitney has been playing Dobro since 2010 and studied under Reso-master Pete Smith. 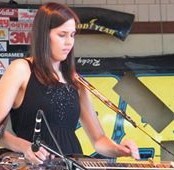 Whitney plays a 2011 custom vintage R model beard dobro. In 2011 she received the VFMA youth scholarship award. From 2012-2013 Whitney attended East Tennessee State University's bluegrass program. 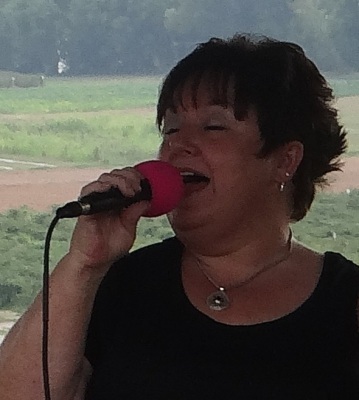 Whitney has played with several band in the Central Virginia area and is not a stranger to many festivals and stages. The biggest influence on her style of playing is Josh Graves and Pete Smith. In Whitney's spare time she enjoys hunting, fishing, bluegrass festivals and spending time with her family. Harmony vocalist, Crystal Grigsby, began singing with Josh at church. They both had a great love for music and spent many hours singing and playing music together, as well as writing songs. She loves adding harmonies to his beautiful tenor voice and enjoys being by his side in this musical journey as a member of Josh Grigsby and County Line. Crystal’s early influences came from her mom and aunts who sang in churches and on the radio when they were younger. Crystal began singing in local church’s with her sister in law and niece in the 1990’s adding harmonies to the group 'The Preston’s'. She loves all types of music, but has a special place in her heart for bluegrass because of its honest, American roots, and having a family that is from SW Virginia, home of Appalachia style music, where many bluegrass greats were born such as Ralph Stanley and Bill Harrell. Her first taste of bluegrass was Bill Harrell, who she claims as her first bluegrass ‘love’. She was hooked on the music and now finds it hard to pinpoint a favorite, although she puts IIIrd Tyme Out and Marty Raybon and Full Circle right at the top of her list. “There is so much talent and so many good songs, it really is hard to pick a favorite” she says. “You will not find any better musicians and just plain out great folks than in the circle of ‘blue’.” Crystal attributes the success of the band to God and is thankful for the opportunities He has provided JGCL over the past couple of years. The past weekend at the Chesterfield County Fairgrounds, the Virginia State Bluegrass Championship Contest was hosted by the Virginia Folk Music Association. Prizes were awarded for bands, vocalists, and instrumentalists alike. Bragging rights for top band go to Josh Grigsby & County Line, from Virginia’s northern neck region. The band’s three vocalists also took the top spots in the Male Vocalist category, and Josh’s wife Crystal might have placed in Female Vocalist had the category not had to be cancelled for lack of necessary registration. In addition to Josh on guitar, County Line consists of Chris Westcott on guitar, Frankie Ballowe on mandolin, Robert Kidd on bass, and Judge Parker on banjo, with Crystal singing harmony. In 2014 they were winners of the band competition at the Bluegrass by the Bay Festival in Gloucester, Virginia. Their debut album, Changes In The Tide, has been recently released and plans are being set now to start work on a second, tentatively titled Ruby Lane Memories. You can learn more about the group online or on Facebook. The Virginia State Bluegrass Championships have been held since 1947 when they were sanctioned by the Governor as the official state competition. All entrants must be legal residents of Virginia, and substantial cash prizes are awarded to the top three finishers in 8 categories. Information about the 2016 Virginia State Bluegrass Championship will be posted soon online. The competitions are always held in early October. Separately, they’ve played many styles of music: gospel, surf, swing, rock, country, folk and, of course, bluegrass. They range in age from 35 to 70, and work in jobs doing everything from defense contracting to principal at a school in Spotsylvania County. They’ve played in other bands with names like The Flatrun Ramblers and Nickel Ticket, and alongside musicians in bands ranging from The Nitty Gritty Dirt Band to Shades of Country. Since 2013, the six musicians who make up Josh Grigsby and County Line have been putting their energies into making sweet and melodious bluegrass music. They do it so well, in fact, that the group with players from the Northern Neck, Fredericksburg and Central Virginia took the 2015 Bluegrass Band of Virginia Championship, awarded by the Virginia Folk Music Association. In that competition, which happened in October at the Chesterfield County Fairgrounds, where their award-winning song was “I Hung My Head and Cried” by Flatt and Scruggs. The bands’ three vocalists also swept the male vocalist category, and some of its pickers took home instrumentalist honors, as well. Those accolades came on the heels of being picked as the best band at the Bluegrass by the Bay Festival in Gloucester the year before. “We feel very blessed,” said lead singer and rhythm guitarist Josh Grigsby, a King George County native who now lives with his wife and the band’s harmony vocalist, Crystal, in the Richmond County town of Warsaw. The other members of the band are Chris Westcott of Fredericksburg on lead guitar, Frankie Ballowe of Mechanicsville on mandolin, Robert Kidd of Mechanicsville on bass, and Judge Parker of Short Pump on banjo. Take a look at the musical backgrounds of the different players, and it’s not hard to see why they have started to pile up accolades and gigs throughout Virginia and neighboring states. Some members have played for decades in musical hotspots from Atlanta to Southern California to Scottsville. “Bluegrass musicians who’ve played for a while share a common musical language,” said Westcott, the talented guitarist who worked as a teacher at Spotsylvania High School and as a principal at Lee Hill Elementary and Battlefield Middle schools. Now retired, he’s enjoying creating a new sound with Josh Grigsby and County Line, which has already released a CD, “Changes in the Tide.” The title song was written for Grigsby’s late father, a Northern Neck waterman. Grigsby, whose smooth tenor is at the center of the band’s sound, said the band came together after meeting each other at bluegrass performances that often turned into impromptu jam sessions. The defense contractor said the players’ very different musical experience and talents have dovetailed nicely to create the band’s sound. “We work had to get the precision and energy that I think helped us do well at the competitions,” he said, noting that nothing can replace hard work and practice time. Read the bios of the band and it’s clear several of the players pursued music as a career until family and work responsibilities forced them to set the banjos and bass fiddles aside for several years. Crystal Grigsby, who aside from singing, does much of the band’s booking and marketing, said the group gets along quite well as friends, which helps since they spend a lot of time together. So where did the band’s name come from? “That’s from where I lived in King George,” said Grigsby, noting that was close to the county line between King George and Westmoreland.